MANCHESTER, N.H. — The 2012 primary campaign has been by far the most volatile on record, with one candidate after another surging to the front of the pack and then falling back again. Although this might seem self-evident, it can also be quantified. The Times’s FiveThirtyEight blog has developed a measure of poll volatility that calculates how much a candidate’s polling shifted month to month, above and beyond random variance. 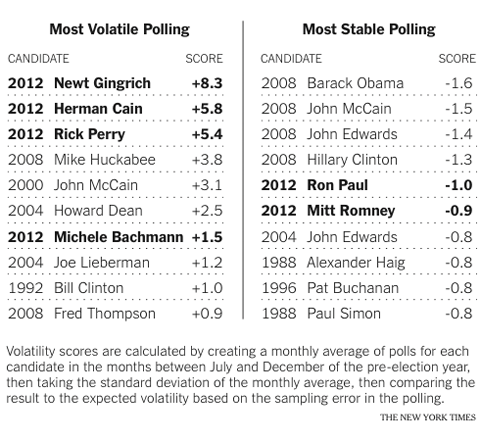 Since 1984, when primary polling became widespread, the candidates with the three highest volatility scores have been Newt Gingrich, Rick Perry, and Herman Cain, all of whom ran this year. But there are also two candidates who have been clear exceptions. Support for Mitt Romney and Ron Paul has remained remarkably stable. They also happen to be the favorites in Tuesday’s New Hampshire primary. What might explain their ability to avoid the swings of their rivals? In part, it relates to an old-fashioned form of politics: the ground game. Mr. Romney and Mr. Paul have built the best field operations in New Hampshire and other early-voting states, many Republicans say. Mr. Romney’s campaign office on Elm Street here is a hive of activity. On Saturday, more than 100 staff members and volunteers packed the premises, bounding around and leaving a tower of pizza boxes in their wake. Mr. Paul’s office, although not as well staffed, operates with military-like discipline. Visitors’ names and phone numbers are promptly entered into a database. Doors are kept closed, and a “liberty bell” rings every time a caller converts a supporter from another campaign. It rang five times in our 20 minutes there. But Mr. Romney and Mr. Paul are more than the exception than the rule, Republicans say. Other Republican field operations fall well short of historical New Hampshire standards, by several measures. Rick Perry’s office is just a mile down the road from Mr. Romney’s, occupying much of the ground floor of a 12-story building. But it seems to exist in a parallel universe in which the primary has been called off. On Sunday, the office was run by a single mid-level staff member, whose voice echoed throughout the room. Everyone else was out knocking on doors, he said. Mr. Gingrich’s office was marginally better off. There was little evidence of organization; we roamed for five minutes before one of the dozen volunteers greeted us. Operations like these suggest that campaigning in New Hampshire has undergone a paradigm shift: from a ground war, dominated by door-knocking and phone calls, to an air war, in which the candidate’s fortunes are determined by paid and free media. Retail politics still exist — Jon M. Huntsman Jr. alone has conducted more than 160 events throughout the state — but the campaigns often leave little trace once the candidate is gone. Mr. Romney’s Elm Street office, and Mr. Paul’s in Concord, are impressive partly by comparison: they are their candidates’ only field offices in the state, but they still give each man a comparative advantage because no Republican campaign has more than two field offices here. At this point in 2008, Hillary Clinton and Barack Obama each had 16 field offices here, while John Edwards had 19, giving them a constant presence in small towns. In 2004, Wesley Clark’s middling campaign had 11 field offices, and Howard Dean’s had so many volunteers it opened two offices in Manchester alone. Even Mr. Romney, who likes to run a tight ship, has scaled back to one office this year, from two offices four years ago. “This has never happened before,” said Ray Buckley, chairman of the New Hampshire Democratic Party. “You would go to Claremont and there would be five or six offices,” Mr. Buckley said, referring to a small city in central New Hampshire. Stephen Duprey, the Republican National Committeeman for New Hampshire, agreed that this year was an anomaly, because most candidates had not opened offices outside of Manchester. Some of the difference reflects strategic choices. New Hampshire is a small state. And phone calls can be placed from anywhere, using a script. But much of the shift boils down to money. In a stagnant economy and facing increasing competition from “super PACs,” campaigns have failed to raise much of it. Mr. Cain and Mr. Gingrich, with little money to spend, relied on media-driven swings in momentum, leaving themselves vulnerable when it reversed course. Mr. Perry’s campaign took in more cash, but chose to fight by air. It spent the most money on advertising in Iowa, but had only middling rates of success contacting voters directly, leaving it with no reservoir of good will after he struggled in the debates.